Gulshan-e-Maymar is a reputed housing project located in the outskirts of Karachi near to main Superhighway. The design of the project has a lot of resemblance with the federal capital. Therefore, it is often referred to as Mini Islamabad. The project is enriched by the neatly trimmed parks, wide and clean roads, modern clubs, and rest houses. Maymar was come into being in 1980. Mr. Hafiz Sadiq Hussain and Syed Mazhar Ali launched this project as a model community in the outskirt of the Karachi city spread over the area of 139-acre. The project saw a massive extension over the years and extended to over 1000 acres by the year 2000. The people were quite impressed by the well-planned project. In 2007, the founders of Maymar decided to sell out their equity to a well-known group of real estate builders. This group further transformed society into a master-planned society. Currently, Gulshan-e-Maymar has consisted of 12 sectors, Q, R, S, T, U, V, W, X, Y, ZA, Z and TA. One of the highly secured societies of the city with a continuous patrolling in the area by security escorts. Calm and Peaceful Area in the outskirts. Availability of all basic facilities within the walking distance. Rickshaw, Taxi, Online cab services, and private pick and drop services are the main mediums of travel for the residents of Gulshan-e-Maymar. Moreover, a public bus named as A-25 has a route entering from Maymar through Gate Number 1 and it goes through Sectors Y, Z, and X, picking up passengers. After exiting Maymar, it goes straight to Al-Asif Square, Sohrab Goth then Water Pump to Aisha Manzil. Following its route, the bus gets to Karimabad, Liaquatabad No. 10 to Nazimabad and so on into the city. There are a number of markets available in Gulshan-e-Maymar. Each sector has a grocery store. However, the main market is located in sector Z. The oldest and the most well-known supermarket Welcome superstore is also located in sector Z. The superstore offers a wide range of household supplies, cosmetics, gift items, and grocery items. In sector Z, you can find almost everything, from medicines and meat to grocery and electronics, everything is available here. Other than Sector Z, Sector R has Tara General Store and Afaq Mini Mart. Sector W has Imtiaz Supermarket while Sector T has Noorani General Store. There is also a religious University located near Gulshan-e-Maymar. It is a university, that provides quality religious and modern education in a sharia-compliant environment. The university has hostel facility available for its students. 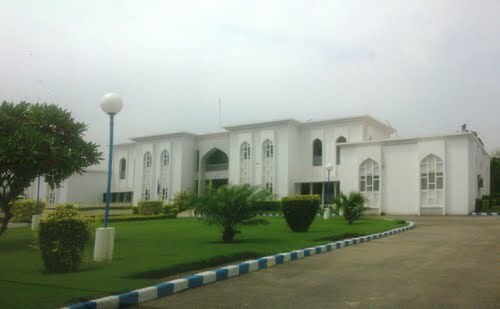 Jamia-tur-Rasheed also offers its students merit-based scholarships. Health facilities available at Maymar allows its residents to access a number of hospitals and clinics. Sector Z has Faiz-e-Aam Medical Center. Sector W has Afsar Memorial Hospital. It is fully-equipped to handle any sort of medical emergency. The hospital has consultant clinics, operation theatres, and emergency wards. Sector X has Hassam Homeo Clinic, Fatima Homeo Clinic, and Dr. Sumera’s Clinic. However, Pasha Medical and Surgical Center is situated in Sector Y. It not only provides medical services like nebulization but also offers the collection of blood samples for lab tests from your doorstep. Gulshan-e-Maymar is one of the most favorite locations for house seekers. Houses in the community are available on various sizes starting from 80 sq yd till 500 and 60 sq yds. For a note, 200 sq yd houses are available in both single and double units. They usually have five to six bedrooms with attached washrooms, an American Kitchen, Study Area, Spacious lawn, and a drawing/dining area. The prices for 200 sq yd ranges from almost PKR 1 crore to as much as PKR 31 crore depending on its location and development. However, the asking rates for 120 sq yd houses tend to be a little less as compared to other areas of the city. Prices for 120 sq yd ranges from PKR 6 million to as much as PKR 1.5 crore. Gulshan-e-Maymar has 120 sq yd, 200 sq yd, 240 sq yd, 400 sq yd and 600 sq yd plots. You can also get many options in 120 sq yd plots such as road facing, park-facing, corner, west open, and east open. Sector Q is the most enriched sector when it comes to investing in plots. Various sectors of Maymar also offers 200 sq yd plots for sale. You can also purchase 400 sq yd plots in Gulshan-e-Maymar and that too with approved ground-plus-one map, having a front at a 200ft wide road. Gulshan-e-Maymar has many studios, 1-bed, 2-bed, and 3-bed flats available for sale. The prices for a couple of bed apartment essentially starts from as low as PKR 5 lac, mounting up to 84 lac. However, if we talk about 3-bed apartments, these apartments are available at Maymar with fully furnished bedrooms with wooden cabinets, tile flooring, open terraces, a storeroom, basement with car parking, an American-style kitchen, 24/7 supply of line water and standby generators. Rates for 3-bed ranges from PKR 40 lakh to PKR 1.2 crore. Gulshan-e-Maymar is a very attractive destination for businessmen. Many businessmen prefer to invest in the commercial properties of Maymar. You can easily find a commercial plot of various sizes such as 80 sq yd, 120 sq yd, 200 sq yd, 240 sq yd, 350 sq yd and 1000+ sq yd. Sector X and Sector Y also offer you shops for investment purpose. There are many shopping centers available within the vicinity. Women usually visit Colours and Fabrics collections for their shopping related to fabric. Colors and Fabrics Collections is situated in Sector X. The outlet offers a wide range of both casual and formal dresses at affordable prices. Moreover, popular brands like Bin Saeed and Gul Ahmed have also opened up their brand outlets in Gulshan-e-Maymar. If you’re a food lover, Maymar has to offer you one of the best delicious lachaydaar parathy with doodh patti the one and only Shafiq restaurant, But if you’re coming on weekends, be prepared for a long queue. People come and wait for their turn since early morning during weekends. In the afternoon, the restaurant offers a wide range of scrumptious desi cuisines such as chicken qorma, karahi, biryani, nihari, paaye, and other delectable dishes. JF restaurant is another popular eatery in the area particularly if you’re interested in Burger, Chicken Biryani, Chicken Qeema, and Haleem. You can also enjoy the famous fish and chips and creamy pasta exclusively from Z-six restaurant, located in sector Z. The restaurant also offers a wide range of mouth-watering burgers. You can also find Chaudary Mohsin foods in Sector Z-2. It has a large menu related to BBQ items, Chinese and rice dishes. Karachi’s signatory Shaheen Shinwari Restaurant is also just 13 mins drive away from Gulshan-e-Maymar. Gulshan-e-Maymar has some of the finest bakeries of the city such as Zouq-e-Shireen, Noor sweets and Bakers, and Maymar sweets. You can get a wide range of fresh bakery items such as freshly baked bread, chicken patties, gourmet cakes, pastries, donuts, and many such items. If you’re a health enthusiast, the modern gymnasiums at Maymar are well-equipped with all the necessary equipment and advance machines required for physical training. There are several other fitness clubs in Gulshan-e-Maymar such as Slim and Fit Club and Swimming Pool, Omni Fitness, Ali Baba Health Club. There is also a sports ground for children in Sector W. While, a dedicated football ground is situated in Sector T.
Gulshan-e-Maymar is famous for its exceptionally beautiful and manicured parks. Each area has lush green landscape park. Maymar has a designated area of 86.2 acres for parks and playgrounds. Additionally, the township also takes care of an enormous nursery of plants. Parks are normally closed during winters for the preparations of the annual flower show. During the flower show, the parks are judged by horticultural experts, who visit the sites and evaluate parks in terms of how well manicured they are, how are the decorations standards, and how the park is maintained to welcome the spring season. Sector V park won the first price in the competition last year, in March. The interesting thing in these parks in Maymar is that each park has its own unique design, eg., The park in Sector U has a pond full of ducks in the center. The park in Sector V is often called as Chatree (umbrella in Urdu) park. 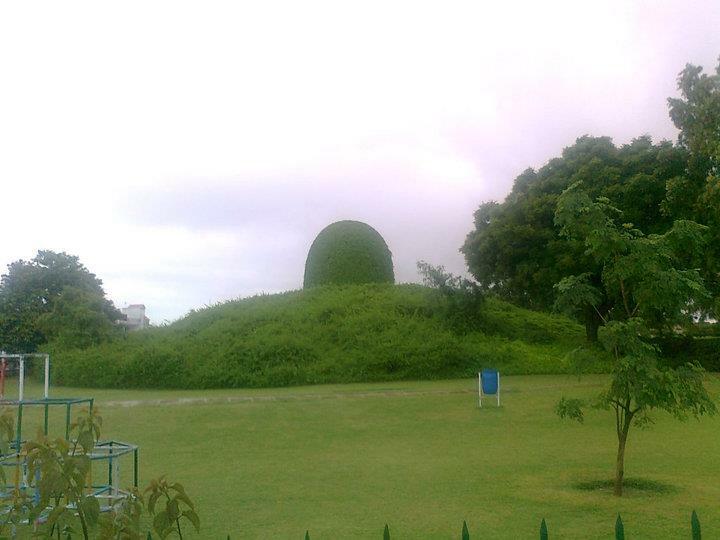 The core reason behind it is the umbrella-shaped dome-like structure at the top of the park. People sit there and enjoy the cool evening breeze. The park is a popular spot among families for their recreational activities. There are swings and slides for children. Moreover, properly decorated flower beds and a maze embellished with seasonal flowers add more beauty to the park. Gulshan-e-Maymar has a Central Park, The Nawaz Sharif Park, situated in Sector X. The park is named after the former prime minister Nawaz Sharif Park as it was inaugurated by him. It is a very large park by area and has lively fountains and colorful flower beds. It is a huge park with lively fountains and colorful flower beds. Maymar also has a Roman Fountain Park. The design of the park has been inspired by the ancient Roman aqueducts. There is a stone roof, which spouts water directly into a pool, giving a rain-like effect. 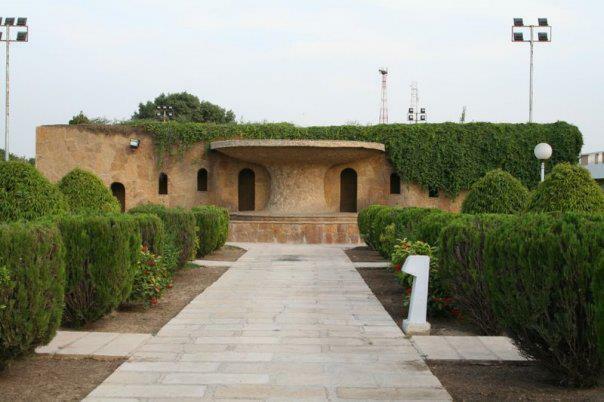 People enjoy the experience by standing inside the area, made of polished stones. All of these parks feature well-maintained grass and jogging tracks, where people follow their daily exercise regimen. Dreamworld Resort is one of the exciting places you can plan for your weekend. Adjacent to Sector R of Gulshan-e-Maymar, the resort offers many thrilling features such as a go-kart track, horse riding, a golf course, desert safari snow area, boating, water slides, horse riding, and archery. 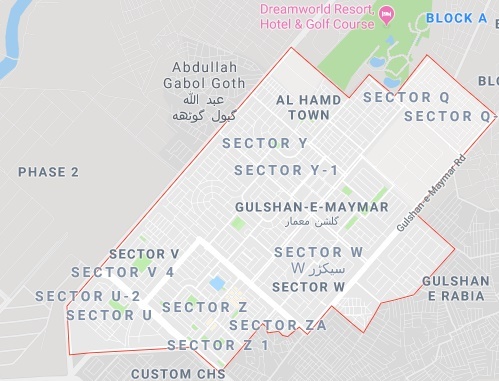 Other than this, Gulshan-e-Maymar has some of the reputable housing schemes in nearby such as Ahsanabad, North Karachi, and Fazaia Housing Scheme. Gulshan-e-Maymar is a serene and peaceful locality. However, there are a few things to consider before making a decision to move here. There is an adequate supply of water in the area, but during summers, there is an issue of water shortage in the area. Most people use suction pumps, due to which some of the houses do not receive adequate supply on a regular basis. Moreover, some of the sectors do not have a K-Electric pole, which adds to power-related woes of the people. But work is being done to have more KE poles installed in Maymar. Overall, with abundant greenery and serene environment, people prefer living in Gulshan-e-Maymar. Almost 30-minutes drive to reach Civic Center.